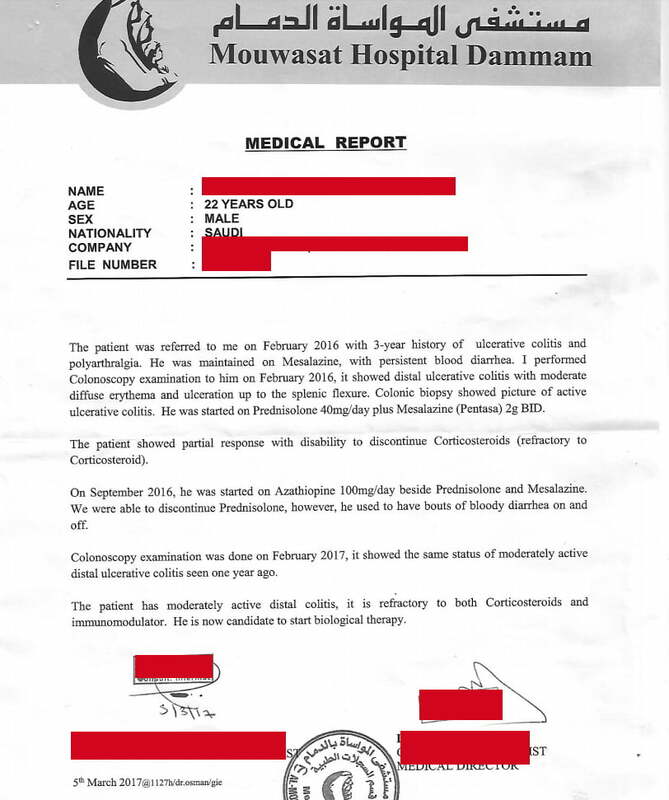 On April 18, 2017, we received a message from someone asking for treatment for his brother, 22 years old, who has been suffering from ulcerative colitis and ulcerative proctitis with acute diarrhea for 3 years. 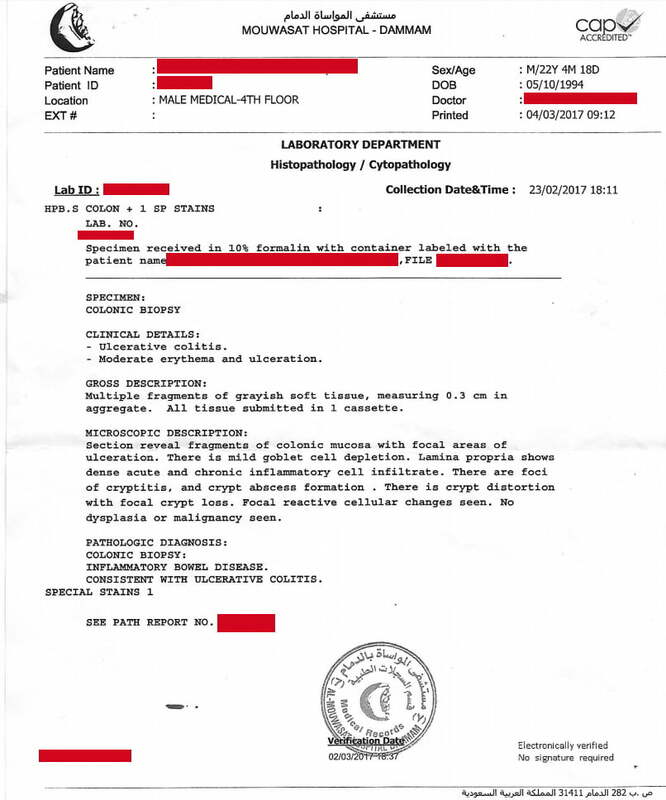 Attached below, are screenshots of the medical reports prior his treatment with Hekma Center. 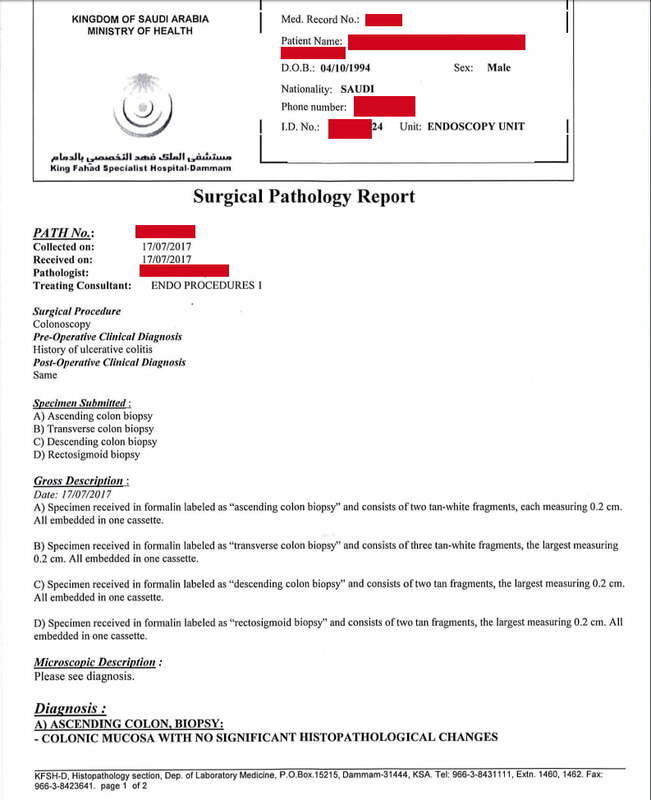 Prof. Hani Younis reviewed his medical file and accordingly decided on a treatment plan that the patient should start with. 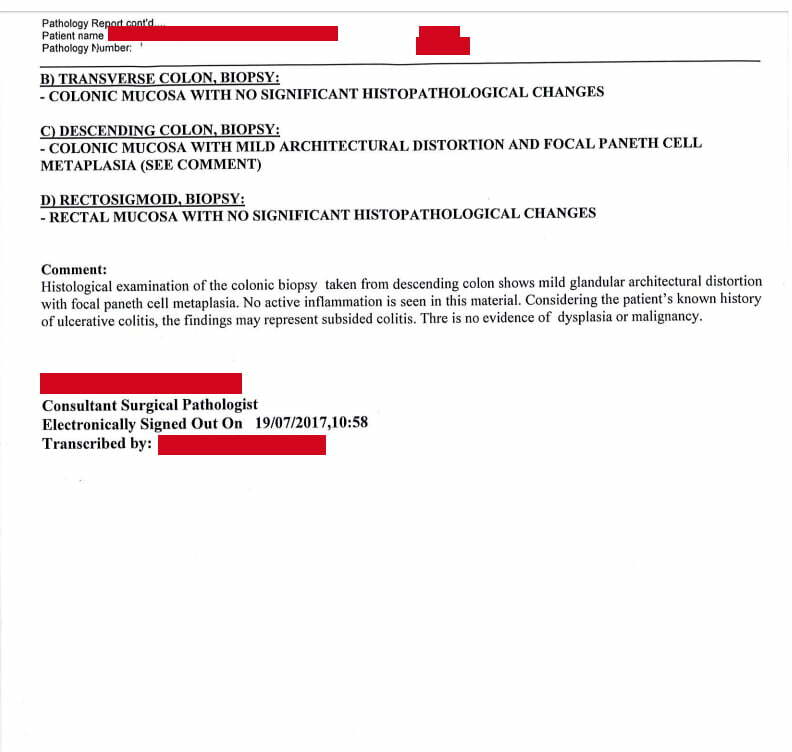 Afterwards, the patient received an informative and detailed reply from our center that same day, about his condition and the suggested treatment plan (costs, methods of use and ways of shipment). 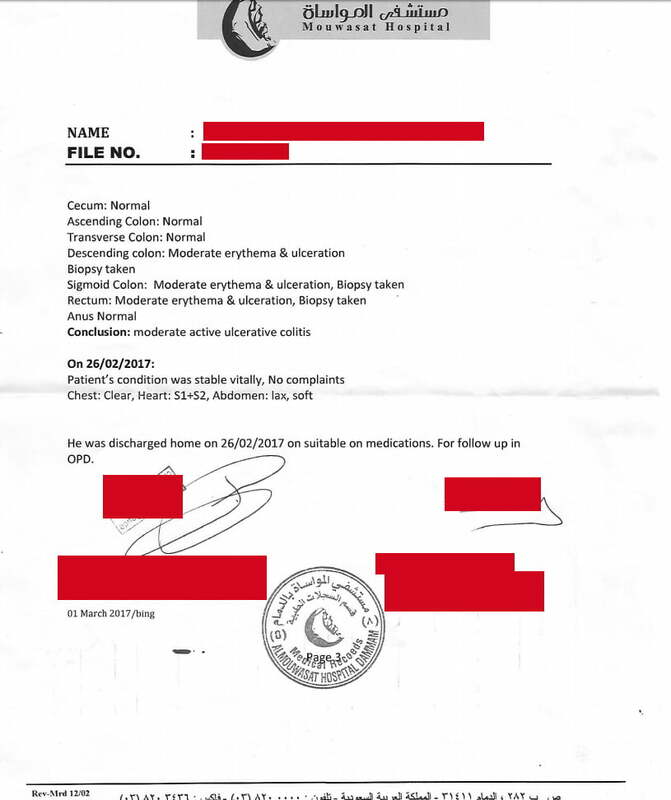 He ordered his first therapeutic package on April 23,2017. 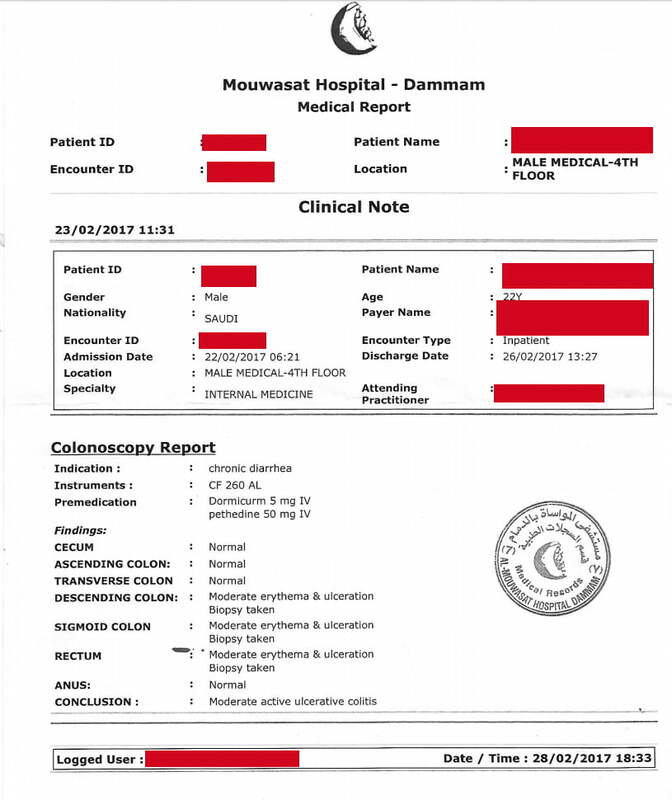 We contacted the patient after a while to check on his condition. 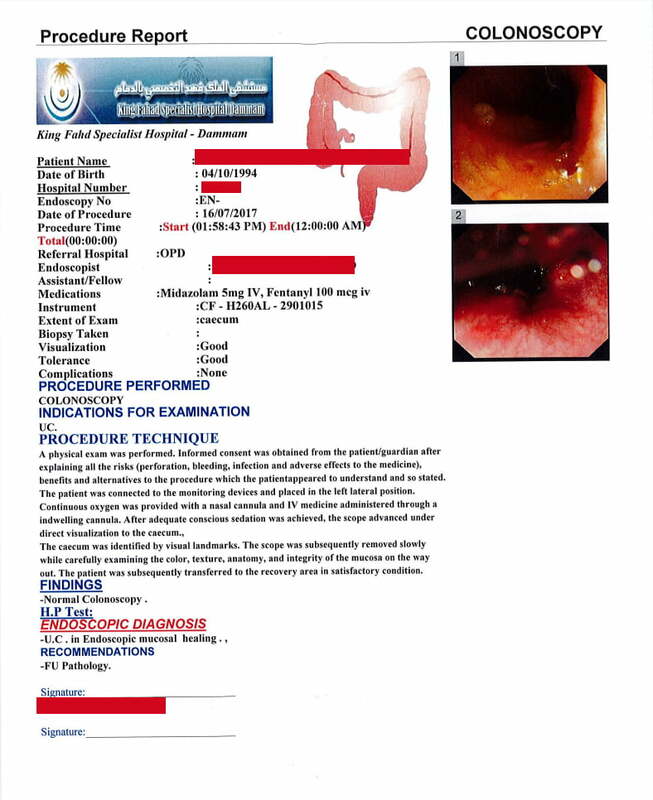 His brother informed us that there is a significant improvement in his condition and that he did colonoscopy and the results were good and promising. 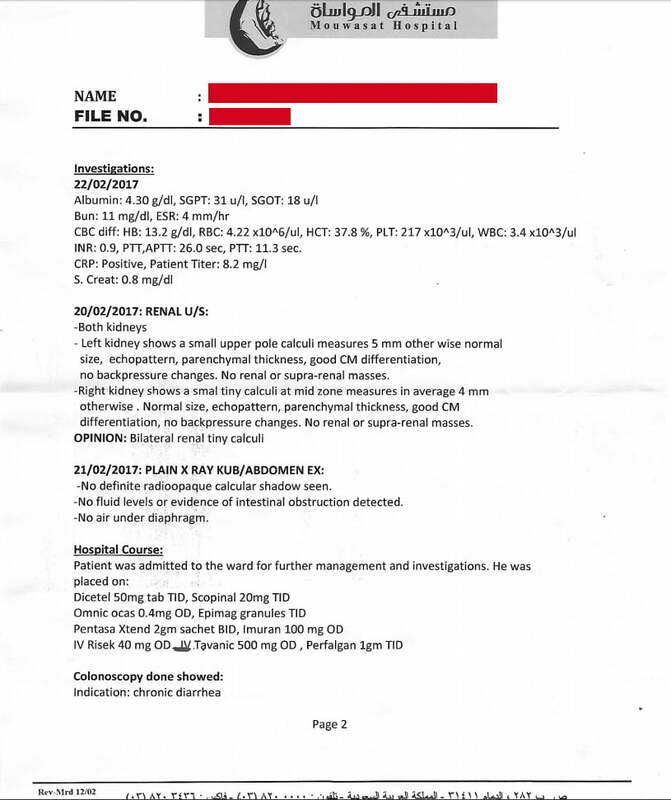 Attached down below, their message to us with the medical reports that indicate the patient’s recovery from ulcerative colitis on July 24,2017. 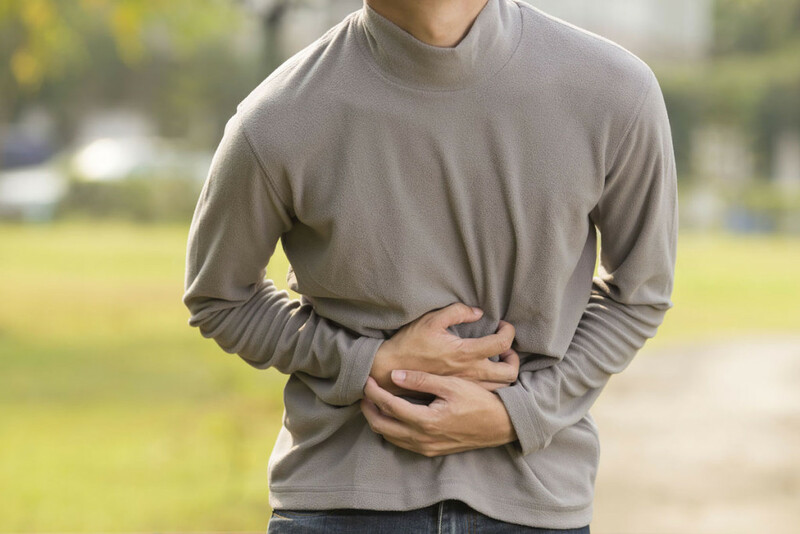 The patient’s father also contacted us on whatsapp and assured his son’s recovery and ordered the preventive treatment for his son to prevent the recurrence of inflammation to the colon and to help strengthen the colon and the digestive system in general. 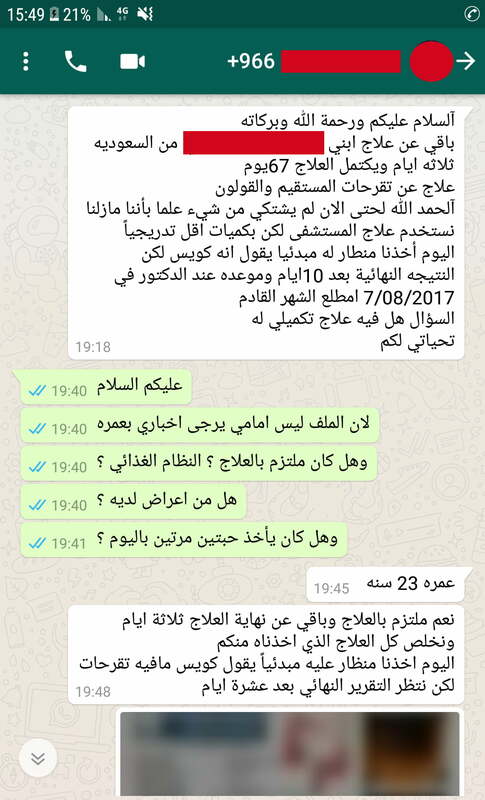 Attached below is a screen shot of his message on whatsapp. 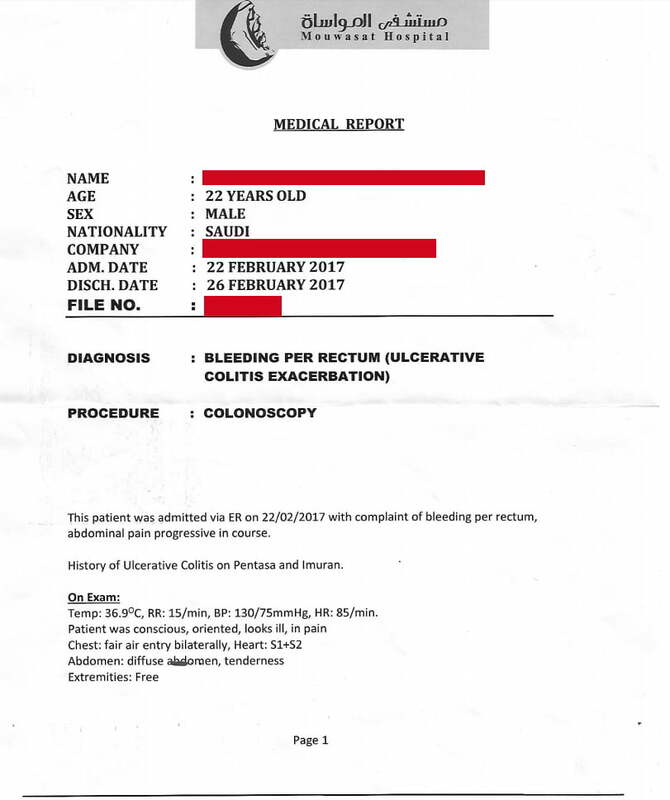 Eventually the patient had finished the preventive treatment and today he is back to normal and does not suffer from any symptoms of ulcerative colitis. He had disposed all chemical medications he used to take. May Allah (SWT) grant him with forever health and well-being. 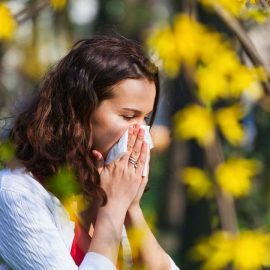 A Thank You Letter from a Patientwho Has Recovered from Spring Allergy and Hypertension. In Hekma Center we strive to provide customers with the best services and most efficient natural remedies and organic products. Our treatment method is distinctive, different and innovative. All our products are 100% natural with no artificial ingredients and no preservatives and hold international accreditations namely GMP, ISO and FDA.